BACKGROUND: Increasing demand for magnetic resonance imaging (MRI) has resulted in longer waiting times for elective MRI, particularly in resource-limited healthcare environments. However, inappropriate imaging requests may also contribute to prolonged MRI waiting times. At the time of the present study, the waiting time for elective MRI studies at Tygerberg Hospital (TBH), a tertiary-level public-sector healthcare facility in Cape Town (South Africa), was 24 weeks. OBJECTIVES: To document the nature and clinical appropriateness of scheduled TBH outpatient MRI examinations. METHOD: A retrospective analysis of the referral forms of all elective outpatient MRI examinations scheduled at TBH from 01 June to 30 November 2011 was conducted. Patient age, gender, clinical details, provisional diagnosis, examination requested and referring clinician were recorded on a customised data sheet. Two radiologists independently evaluated the appropriateness of each request by comparing the clinical details and the provisional diagnosis provided with the 2012 American College of Radiology (ACR) guidelines for the appropriate use of MRI. RESULTS: Four hundred and sixty-six patients (median age 42 years; interquartile range 19-55) who had 561 examinations were scheduled in the review period; 70 (15%) were children less than 6 years old. 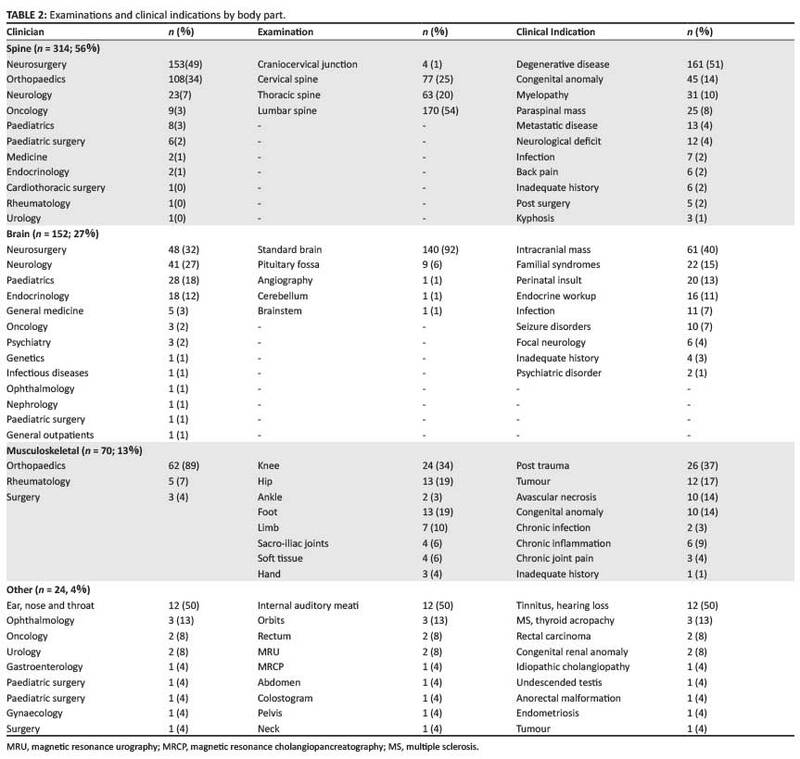 Neurosurgery (n = 164; 35%), orthopaedic (n = 144; 31%), neurology (n = 53; 11%) and paediatric (n = 27; 6%) outpatients accounted for the majority (81%) of referrals; 464 (99.6%) were from specialist clinics. MRIs of the spine (n = 314; 56%), brain (n = 152; 27%) and musculoskeletal system (n = 70, 13%) accounted for more than 95% of the investigations. In 455 cases (98%), the referral was congruent with published ACR guidelines for appropriate MRI utilisation. CONCLUSION: Scheduled outpatient MRI examinations at TBH reflect optimal clinical use of a limited resource. MRI utilisation is largely confined to traditional neuro-imaging. 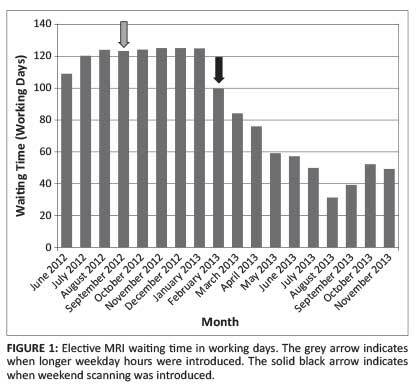 Any initiative to decrease the elective MRI waiting time should focus on service expansion. One of the Western Cape's public-sector MRI scanners is installed at Tygerberg Hospital (TBH), a tertiary-level teaching facility offering a broad range of medical, surgical, paediatric, obstetric, oncological and psychiatric specialist and subspecialist services. At the time of this study, TBH possessed a 1.5-T Siemens Magnetom Symphony MRI scanner, commissioned in 2002. Elective outpatient MRI scans were scheduled during normal working hours (weekdays 08h00-16h00). The waiting time for elective MRI scans was 24 weeks. Waiting times may be shortened by matching supply with demand. Reduced demand could be achieved by eliminating inappropriate investigations, whilst an increase in supply requires service expansion.20 The present study was undertaken from the standpoint that inappropriate examinations should be eliminated prior to considering service changes. At the time of the study, all TBH MRI requests were screened and approved by a consultant radiologist. Although departmental protocols were available for the validation of emergency MR scans, no formal guidelines governed the approval of elective scans; this was seen as the prerogative of the duty consultant, based on the clinical merit of each case. No formal quality assurance procedures were in place to assess the appropriateness of elective scan validation. Coinciding with the commencement of the study, guidelines for the appropriate clinical use of MRI were published by the American College of Radiologists (ACR).22 Studies of MRI utilisation in well-resourced countries have shown that referral patterns are determined by ease of access to the modality.23 To the best of our knowledge, there is no comparable data from resource-limited healthcare environments, where a different disease burden and more stringent resource constraints may affect MRI utilisation. Knowledge of the utilisation of capital-intensive healthcare resources is important at provincial and national government level to facilitate planning for optimal public-sector resource allocation, particularly in resource-restricted environments. It was hypothesised that inadequate vetting of clinical referrals contributed substantially to the long waiting times for elective TBH MRI examinations. To document the nature and clinical appropriateness of scheduled TBH outpatient MRI examinations. A retrospective analysis of the referral forms of all elective outpatient MRI examinations scheduled at TBH from 01 June - 30 November 2011 was conducted. Patient age, gender, clinical details, provisional diagnosis, the examination requested and referring clinician were recorded on a customised data sheet. Two radiologists independently evaluated the appropriateness of each MR request by comparing the clinical details and the provisional diagnosis provided on the request form, with the 2012 ACR guidelines for the appropriate use of MRI.22 Where radiologists differed in their individual assessment of the appropriateness of an imaging request, consensus was reached after discussion. The study was approved by the Health Research Ethics Committee of the Faculty of Medicine and Health Sciences at Stellenbosch University and by TBH Management. Four hundred and sixty-six outpatients (female = 267; 57%) with a median age of 42 years (interquartile range 19-55), had 561 elective examinations scheduled in the review period. Multiple examinations were requested for 72 (16%) patients; 70 (15%) patients were below the age of six years and required sedation or general anaesthesia for a technically optimal study. The neurosurgery (n = 164; 35%), orthopaedic (n = 144; 31%), neurology (n = 53; 11%) and paediatric (n = 57; 6%) outpatient clinics accounted for the majority (81%) of referrals. With the exception of two cases from general outpatients, referrals (n = 464; 99.6%) were from specialist or subspecialist clinics (Table 1). Examinations of the spine (n = 314; 56%), brain (n = 152; 27%) and musculoskeletal system (n = 70, 13%) accounted for more than 95% of investigations (Table 2). More than 90% (n = 284) of examinations were referred from the neurosurgery, (153/314; 49%), orthopaedic (108/314; 34%) and neurology (23/314; 7%) outpatient clinics. More than half were for degenerative disease of the spine (161/314; 51%) (Table 2). Referrals from neurosurgery (48/152; 32%), neurology (41/152; 27%), paediatrics (28/152; 18%) and endocrinology (18/152; 12%) predominated. Definitive evaluation of an intracranial mass was the most common indication (61/152; 40%), whilst familial syndromes (22/152; 15%) and perinatal insults (20/152; 13%) together accounted for more than a quarter of referrals. 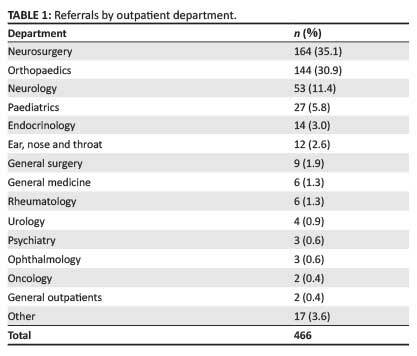 The majority of referrals were from orthopaedic outpatients (n = 54/65; 83%) and indications included follow-up for joint trauma, congenital abnormalities and soft-tissue tumours (Table 2). To our knowledge, the present study is the first of its kind in a tertiary hospital in a resource-restricted environment, and provides important insights into the utilisation of MRI in such a setting. We have shown only limited use of MRI by clinicians other than neurosurgeons, orthopaedic surgeons and neurologists, suggesting that, in a resource-limited environment, utilisation is confined to the more established clinical indications, and the role of MRI in areas such as oncology, cardiology, urology, hepatobiliary, gastro-enterology, female imaging and fetal medicine is constrained. Given the appropriateness of TBH clinical referrals and the knowledge that MRI utilisation at TBH was confined to a relatively narrow spectrum of 'classical' brain, spine and musculoskeletal studies, it was felt that the only way to address the waiting list was to extend the hours of operation. Of note is that no attempt was made to modify institutional imaging protocols for marginal savings in scan time, since we had shown that TBH used a limited number of standard examinations that had been consistently refined and optimised by both the vendor and international users over more than 30 years of clinical application. From September 2012, MRI scanning hours were extended by nine hours per week (Tuesday - Thursday, 16h00 -19h00). This intervention stabilised the waiting time but did not reduce it (Figure 1). Unforeseen barriers to successful utilisation of the additional scanning hours were transport problems amongst patients in getting to and from TBH in the early evening, and patient concerns for personal safety when travelling home. From February 2013, TBH hospital management sanctioned a further 13 scanning hours per week, from 08h00 - 16h00 on Saturdays and 08h00 - 13h00 on Sundays. This resulted in an immediate and striking decrease in waiting time, from 125 working days in January 2013 to 59 days in May 2013 and 31 days in August 2013 (Figure 1). The additional scanning hours were implemented at an estimated annual operating cost of R371 000 (about R7500/ weekend) for additional radiographic and nursing services. This represents approximately 2.5% of the current capital outlay for an MRI machine and approximates the 'cost-to-company' of one fulltime entry-level public-sector radiographer. Some important considerations relating to the provision of capital-intensive imaging services in a resource-limited healthcare environment have been highlighted. These include the imperative to constantly evaluate the appropriateness of clinical utilisation of a scarce resource, the ongoing challenge of matching clinical need with system capacity, the importance of collaboration between hospital management and the radiology department in addressing service pressures, and the potential for minor, affordable service changes to yield major clinical benefits. Our experience suggests that the artificial barrier separating 'normal hours' and 'after hours' imaging services should be annulled in a resource-constrained environment, and that capital-intensive equipment should be fully utilised, seven days a week.1 We have demonstrated the substantial service benefits resulting from a small additional investment in key personnel. We recommend that all capital-intensive equipment be commissioned with budgetary provision for the personnel required to run an optimal service seven days a week. The authors declare that they have no financial or personal relationships that might have inappropriately influenced them in writing this article. F.J.v.S (Tygerberg Hospital and Stellenbosch University) was solely responsible for data collection and collation. F.J.v.S (Tygerberg Hospital and Stellenbosch University) and C.A. (Tygerberg Hospital and Stellenbosch University) evaluated the appropriateness of all clinical requests. F.J.v.S and R.D.P. prepared the manuscript. C.A and R.D.P supervised the research project.